Fine £5 or 13 days detention. For sale by auction 15th February 1811, advantageously situated next the cattle market on the Castle Ditches, with large yard, a spacious stable and a piggery, well adapted for the accommodation of persons resorting to the market with their cattle. In the occupation of Mr. James Carver. Offered To Let April 1814. With Stables, Piggeries, large Yard and other Buildings. The most desirable Situation in Norwich for a Dealer in Stock, Hay or Corn, Seed or Liquor Merchant. In November 1815, twenty acres of Capital Turnips were advertised for sale - Apply of Mr. Carver, Golden Ball Inn. 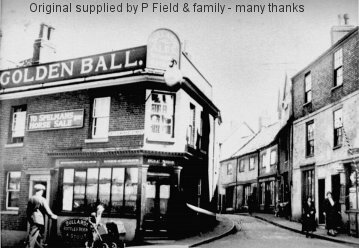 March 1817 - James Carver of the Golden Ball, informed Gentlemen, Farmers and others that he had for sale a large quantity of Suffolk Hardland Grass Seeds of superior quality. Mr. C. Thompson of the Golden Ball advertised 5th November 1864 that a beer engine, in excellent preservation, being only installed for three months, was For Sale. Stood on the corner of Cattlemarket Street and Rising Sun Lane. The licensing records state that the house was previously the Rising Sun. However both houses are listed 1865 and before. William Playford appears at the Rising Sun from at least 1851 to 1867. It seems that when the RISING SUN closed c1867 William Playford took on the GOLDEN BALL and the licence from the RISING SUN came with him. 1868 reference states that licence was dropped, this is presumably the Full Licence from the original GOLDEN BALL dropped to the Beerhouse licence of the previous RISING SUN? The property was compulsory purchased according to note from Customs Office dated 23.03.1962 and trading was (said to be temporarily) discontinued.